I have done bad things. I can't take them back, and they are part of who I am. Veronica Roth is a genius; I now have another favourite author. Insurgent starts straight off from where Divergent finished. I can't say that it has a specific location, because the book was so fast paced, with numerous environments, unlike the first in the series, Divergent. In normal circumstances, this would've majorly turned me off a book, but Roth's writing never made me feel rushed - even if it did, it tied in perfectly with the dystopian genre. One of the things that I love most about this series is Tris' character. It's developed so much - anyone who's read the books can tell. At the beginning of Divergent, Tris - sorry - Beatrice seemed so lonely and brainwashed. It was so fun reading from her perspective in Insurgent, mainly because she was so unpredictable. Still is. It's protagonists like her that are evidence of YA at its best. Then comes Tobias. Sigh. This is another of my hormone-crazed moments. One thing I picked up on while reading this was that we kind of get the impression (well, I do anyway) that Tobias is more 'into' Tris than she is with him. That thought was just continuously nagging at me. Yet, when I thought about it more, it was kind of a relief. In all honesty, the majority of books I read are filled with female main character's being completely head-over-heels for a guy who doesn't even know they exist. We're not that desperate. However, I am pleased to reveal to any reader out there who feels like this as well, that it's not going to last. I'm not going to say anymore because I hate giving out spoilers. When I finished this, I was entirely amazed. There was only one thought on my mind, and I thought it over and over: Veronica Roth is so clever. The plot she's created hasn't failed to leave me wonderstruck. I didn't really see it coming. The end result was basically me having a breakdown. Now if you'll excuse me, I'm going to go cry in some lonely corner of my house - in the dark - and mourn the fact that the next book is being released in September 2013. Such a long wait. You can read my review for Divergent, the previous book, here. 5/5 stars - YA at its best. "People, I have discovered, are layers and layers of secrets." Great review. I read Insurgent ages ago and I can't remember anything that's happened!! I think I'll re-read and look closer at the Tris/Tobias relationship. They are so cute together. 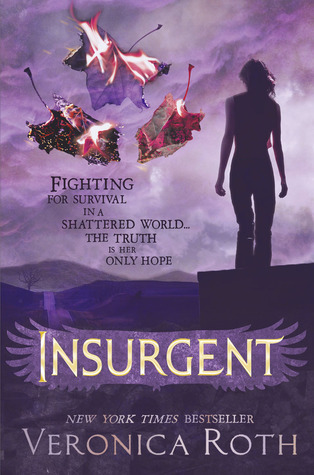 I finally ordered and received my copy of Insurgent last week. I haven't read it yet, but am very excited to! I can relate with what you said about Tobias and Trish's relationship. It will be interesting to discover more when I read Insurgent, and then see how it develops more in book 3. September is going to be a long wait. But hopefully it's released early September, then I might be able to ask for it for my birthday.